Sitting on our veranda overgrown with bougainvillaea, the sunlight simmering of the clear water in the pool and the big old Pine giving shade, you have the most breathtaking view of the Magalies mountain range. 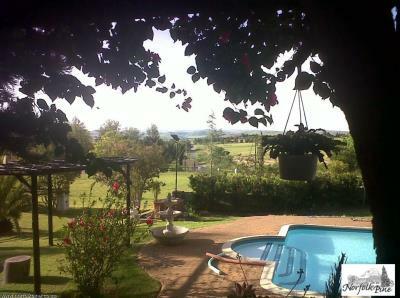 Norfolk Pine Guest house offers select accommodation in Centurion with an individual flair on a bed and breakfast. Our Manor house is located on the beautiful Mnandi plots, smack dab in the middle of the equestrian estates, in Centurion. We have a central location with many amenities close by, for example the new Forest Hill Mall and historic sites like the Cradle of Humankind. Sitting on our veranda overlooking the sun warmed pool and the Magalies mountain range you could be forgiven for mistaking our little slice of heaven for your own. You might even be excused for believing you are in the middle of the bush because we believe we have the perfect place to unwind and cool down after a long warm day of playing or working. Enjoy superb freshly made breakfast and other meals available on request. 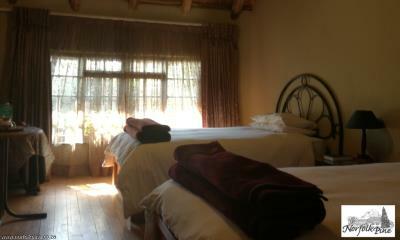 The guest house has double, single and family suites. Every room offers coffee and tea facilities, refrigerator, writing desk and wireless internet connection with a breathtaking view. In the small library lounge area guests can have some peace and quiet while still enjoying the view. A full size Billiard table and swimming pool is also available for the guests entertainment. Norfolk Pine is located in the heart of an equestrian estate mostly focused on show jumping. This adds to the country house feeling while the neighborhood watch ensures the safety and security in the area. A Cape Horn owl pair made their home in our chimney a few years back and at the right time of year we have up to 5 owls singing you to sleep every night. It is a wonderful experience to see the babies on the ground hunting during the evening. 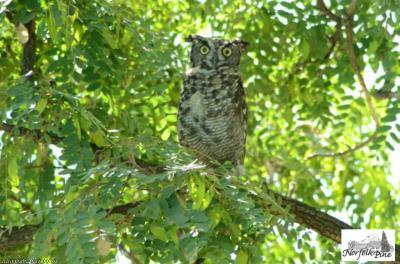 We have a very wide variety of other bird life making it a birdwatchers paradise and a nature lover's sanctuary. For holiday makers there are something for everyone like a day trip from Sun City, Pilansberg wildlife reserve. We are also very near Montecasino, Krugersdorp lion park, Voortrekker Monument, the Union buildings, Melrose house museum and many other museums and heritage sites close enough to one another that more than one can be visited in the same day. Our 3 acres of land add to this feeling of being in the country and yet you are only 3km from Forest Hill City, 10km from Centurion Mall, 10 km from Midrand, 20km from Pretoria mid town, 22km from Sandton, 30km from Krugerdorp and 40km from Johannesburg. Located within reach of whatever you might need, or want, to visit. Shuttle service is available if booked in advance, otherwise Uber will be able to get you where you need to be.